Core subject II: Who Is Jesus Christ? This text presents the Blessed Trinity-one God in three divine Persons: Father, Son and Holy Spirit-which is the central mystery of the Christian Faith. We are called to know and love God and to share in his divine life. 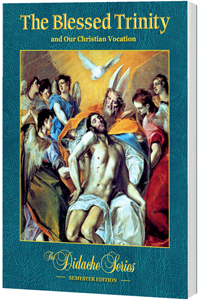 Following the Nicene Creed and based on Sacred Scripture, the role of each Person of the Blessed Trinity in the plan of salvation and the Christian life examined.